← Why Use Floating Covers For Rectangular Water Storage Tanks? Why Use Bolted Steel Tanks for Emergency or Short Term Storage? 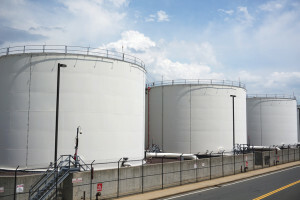 Bolted storage tanks were initially utilized by the oil and gas industry for quick and temporary storage solutions, especially in fracking operations. Since large companies could boost their spending on drilling by 58% in 2017, bolted tank construction still holds a lot of value in these industries. But in recent years, fast bolted tank construction has begun to be used in all sorts of fields. Since our temporary tank rentals can be used to hold water, wastewater, chemicals, and fuels quickly and without a lot of fuss, they’re attractive for all sorts of agencies and organizations, especially in emergency situations. If you need to rent a tank temporarily, bolted tank construction is ideal. They’re easy to assemble and disassemble, which means there’s very little fuss involved. Case in point, a bolted steel tank that can hold over 5,000 gallons of liquid can be ready to go in less than an hour using only two people and ordinary tools. Because these tanks can be set up so quickly, you’ll have one less task to stress about in the event of an emergency. In addition, the panels are easy to transport. They’re incredibly lightweight, which means you can bring them to your site in a pickup truck or even your car. Still, the panels used in bolted tank construction are immensely strong, meaning that you’ll never have to compromise on quality or worry about whether materials will be safely contained. Finally, our quick storage tanks vary greatly in capacity, so no matter how much storage you need, we’ve got a tank that will work perfectly. At ModuTank, our QuickStor tanks range anywhere from 2,200 to 31,700 gallons. And because we keep an inventory of the most popular sizes, we’ll likely be able to ship your tank to you immediately. Because of our tanks’ durability and ease of use, they’re the optimal choice for short term storage or emergency needs. Regardless of your industry or the storage challenges you may be facing, we’ll be here to help. For more information on how our bolted tanks can help your organization meet time-sensitive requirements, please get in touch with us today.